A Christian author from Michigan narrates the ordeal she and her family went through to adopt a baby born in Jamaica. One family’s adoption story is an amazing reminder of God’s grace, faithfulness, and provision. 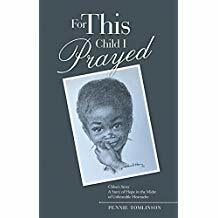 Pennie Tomlinson, an adoptive parent and former missionary to Jamaica, published an account of her and her family’s adoption of Chloe, a baby born in Jamaica to a teen mother, For This Child I Prayed (Chloe’s Story: A Story of Hope in the Midst of Unbearable Heartache). The author, who is adopted herself, narrates the ordeal she, her daughter Kelle, and son-in-law Michael went through to adopt Chloe. It was a journey of heartache, drama, and danger; their experiences reveal the intricacies of international adoption. At the same time, it is also a journey of hope and faith and of calling. Pennie was called to serve as a missionary in Jamaica and became an adoptive parent herself, and Kelle and Michael, being unable to conceive, were called to adopt Chloe. Pennie’s journey to mission and the family’s eventual adoption of Chloe started when Pennie found a sketch of a beautiful little black child with earrings (see book cover) in an antique shop. She felt immediately drawn to the subject of the sketch, whose huge almond eyes seemed to read deep into her soul. One day after Thanksgiving, Pennie heard a voice that told her, “You will be moving to Jamaica to do ministry.” She believed it was a revelation about her future but her commitment to Jamaica grew stronger months later only when she found behind the sketch’s frame, which she bought years earlier in the antique shop, the name of the artist, and date and place it was created – Jamaica. Watch out for the public display of this wonderful book at the upcoming 2018 Miami Book Fair on November 11-18 at the Miami Dade College’s Wolfson Campus in Downtown Miami. Pennie Tomlinson lives in the Midwest with her daughter and son-in-law, Kelle and Michael, and their children Jeremiah, Tiana, and of course, Chloe. Pennie is a mother of five, two of whom are adopted, and she busies herself with family, friends, and volunteering with her church and her community. Following three years of Bible college and having raised her family, Pennie spent ten years living in the mission field of Jamaica, where she served as a missionary and engaged in humanitarian work. Pennie was herself adopted at the age of three, and Chloe and her family’s story in For This Child I Prayed shares Pennie’s particular interest in the subject of adoption.